Mutal thought that the stone was dead and needed to give it life. Later she realized that approach was wrong: the stone strived in her. Perhaps most importantly, it was he who taught her that stone was alive. In her work, Mutal mastered an ancient force: the search for the connection with the stone. The way the sculptress chooses stones for her work is very in tune with her ideas; it's all about a conflict between her and her material. 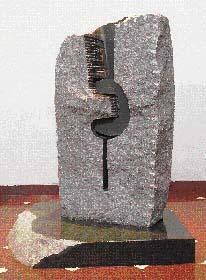 Lika Mutal began her life as a sculptor in Peru in the seventies, and found here her source of inspiration. 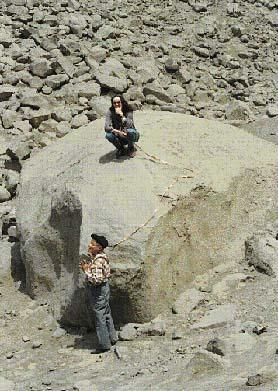 In the garden of sculptress Lika Mutal's studio in Barranco is a stone which has not moved an inch for seventeen years. For fifteen of those years she did not even make a mark on it. "I like to live with a stone a long time before I begin to work it," she says. Today the stone, over a meter high, holds a smooth, carved channel with water trickling into it from a hidden source. Much of the surface is rough, unworked. A hole drilled deeply through the rock admits light from behind. Like many of Mutal's pieces, this fountain stone seems deeply connected to the traditions of ancient Peru. Here, one is reminded of an Inca ceremonial artifact. But she is reticent about this pre-Hispanic strain in her work. In fact, she avoided contact with it completely during her early years in Peru; after arriving in 1970, she resisted visiting the great Incan stone works in Cusco until 1978. "I was afraid that if I went to Cusco I would be paralyzed, I would not be able to work anymore" she says. "I think you have to be very careful with influences. You have to be mature to withstand them." Lika studied at the School of Plastic Arts of the Catholic University in Lima under Anna Maccagno, now the school's director. One day Maccagno brought in Juan Arias, a local stone carver, to teach the students basic techniques. Her life was changed forever. "In three minutes he taught me the lessons that have stayed with me all my life: don't wear gloves - they interfere with your feel for the stone, look at your work, not your hammer or chisel, and work above or below your abdomen to protect your kidneys." Mutal is Dutch, but she became a sculptress after coming to live in Peru. She had trained as an actress in Holland, but the language problem excluded her from local theater. Evidently Mutal needed to express her artistic side to some capacity. She decided to combine raising four children with studying sculpture. She worked in clay, wood and steel, but after meeting Arias, decided to work only in stone. The teachings of Don Juan did not stop at those first simple lessons. Arias became friend and mentor to. Her life as a sculptress has been nourished by his insights. He is 83 now, and is no longer able to work in stone, but she still calls him if she has a tricky technical problem. It was he who introduced her to the multifaceted personalities of stone. Perhaps most importantly, he taught her that stone was alive. Mutal took longer to absorb this subtler reality. 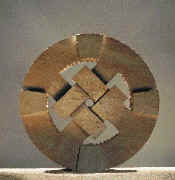 In her early work she was stimulated by the technical challenges of carving. 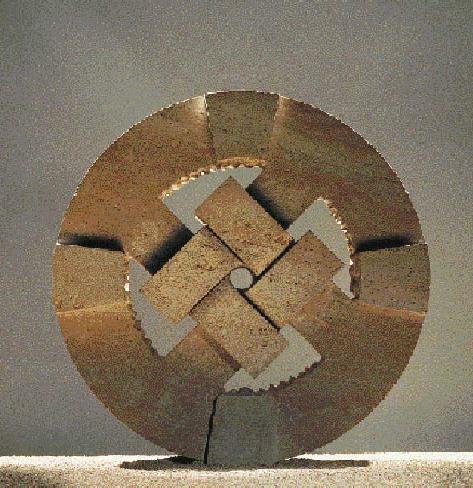 She also felt that stone was static and needed to be given life, so she created virtuoso works complete with moving parts; impossible feats of artful cutting with steel wire and sand. Her creed was that the stone would reveal itself through the technique that she used to carve it. In time she came to see this approach as false. The life of the stone was there already; it would reveal itself on its own terms. She was humbled but not defeated by this discovery, for she also realized that while she had been working on stone, stone had been working on her. "Stones draw you into their silence," she says. A Zen statement; and one that could as well have been made in ancient Peru. An Inca stonemason would hear it calmly, without spilling his chicha. "Stone slows you down. It forces you to work at its pace," she says. "Work with a big piece of it and you will move slowly, like it or not." And Mutal likes big. She has one worked block of travertine in her garden workshop weighing eleven tons. "Working large is one of the great challenges of sculpture," she says. The other great challenge is granite, the hardest stone, the chisel-breaker. "I used to sharpen, heat, and temper twenty chisels every morning when I started working in granite," says Mutal.. But the patience of the sculptress has limits and even granite must yield in certain ways to modernity. Nowadays she works with diamond-tipped mechanical cutters. Lika does not repudiate her early work, but there is no doubt that she has moved on. Today it is this more ancient power that holds her: the search for relation, for connection with stone. "I am fascinated with finding a bridge to the non-human world," she says - and she wants to lead her audience across that bridge. "My goal is to be able to bring to people not just the earth, but the magnetism of the earth, its inherent spirituality." So there it was all along: stone is alive - a notion unsettling to modern humans, but surely mother's milk to the people who carved out Chavin and Tiahuanaco, and most of all to those who made the living rock sculptures that still lie scattered across the Inca heartland. The way she finds the stones for her work is very much in key with these realizations. She explores natural quarries in the mountains where loose stone has been exposed, meandering in search of the one that speaks. The one that calls her back. "In the field they look so small. In my workshop, so large," she muses. Sometimes, more prosaically, she needs to find a particular size, shape and type of stone, to execute a commission. Yet there is always that essential connection with the material which working in Peru allows. At the height of recent political violence she visited Italy, in search of a refuge, should life in Peru become impossible. After she saw the square-cut marble blocks, the production-line treatment of stone there, she decided she would remain rooted in Peru, no matter what. Lika Mutal has found an appreciative audience for her work overseas, and her devotion to Peru alternates with extended periods in the frenetic vortex of New York's art world. Her children are grown now, and she is able to enjoy this double life as does her companion, the Dutch painter Gam Klutier. "It's as if I've made an ideal country for myself, where the capital is New York city, and Peru is my immense garden," she says. She also has a following in Japan where she recently won major national competitions and completed several commissions. Among other works, in Lima, she has installed a piece at the Club Empresarial in the Centro Camino Real in San Isidro, and professes delight with the space this sculpture occupies, a design by Alfredo Montagne which she describes as "post-modern Inca."